6.30 a.m. Is it me - or are we all setting our alarms a little earlier every year to try and beat the traffic? A quick breakfast with my wife sometimes joined by our two young daughters. 7.00 a.m. 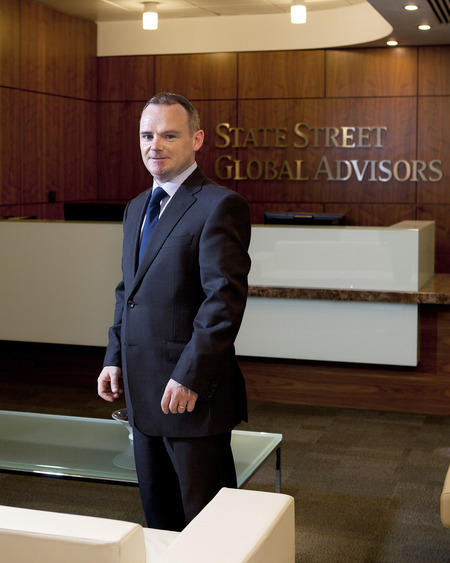 I depart for the State Street Global Advisors (SSgA) office on Hatch Street, where we relocated to in May 2011 following the acquisition of Bank of Ireland Asset Management by SSgA. It’s a short walk from the car park to the office, giving me an opportunity to check the blackberry and grab a coffee en route. 7.30 a.m. Having landed at the desk, I check my diary for the day - see what kind of flexibility there is to catch up on some outstanding matters. I respond to emails and then have a quick scan of the newspapers. There is much coverage of the ECB’s surprising decision to cut interest rates by 0.25 per cent. SSgA is one of the world’s leading cash and short duration fixed income managers. With official rates anchored at such low levels, our extensive range of strategies is proving popular with clients; we find that many investors are increasingly looking to outsource cash management, and the associated credit risk, to specialist managers such as SSgA. 8.30 a.m. I spend the next thirty minutes working on presentation material for an upcoming new business pitch. Since the Pensions Board set its end-June deadline for submission of funding proposals for defined benefit pension schemes, we have seen an increase in scheme activity levels. This has accelerated since the deadline passed as next steps are considered for the de-risking of their scheme assets. 9.00 a.m. I dial into an internal company conference call. We have just completed a complex investment restructure for a key client in conjunction with our colleagues in State Street Fund Services (Ireland) Limited who provide administration and custody services for a number of SSgA’s clients. The purpose of this morning’s call is to address any open action items and to discuss progress towards the impending year-end audit. 10.00 a.m. I make a number of follow-up calls to clients, investment consultants and colleagues, which often alters my agenda for the day. One call is with SSgA’s new Head of European Consultant Relations, Helen Copinger-Symes. Based in London, Helen wants an update from SSgA’s European locations on their specific market dynamics in order to build a high-level perspective on each region. It is always useful to hear the views of colleagues throughout this global organisation, and while each office has unique requirements, there are more similarities than differences. Such calls ultimately help us to improve local service offerings. 11.00 a.m. The Marketing, Relationship Management and Distribution Teams meet to discuss upcoming client information events. The most imminent is a breakfast event for about 30 of our current and prospective clients, to be held in our offices later this month. SSgA’s Chief Investment Officers for Real Estate, Fundamental Equity and Absolute Return strategies will present to investors seeking enhanced return and diversification opportunities. We target around ten of these events annually, regularly using external facilities for larger events in Dublin and Cork. 12.00 p.m. Lunch is with an international asset manager client that uses the SSgA SPDR range of Exchange Traded Funds (ETFs). They use SSgA SPDR ETFs to complement some of their own investment strategies and to close out specific sectoral exposures. The ETF market in Europe is growing significantly. SPDR has a reputation as an industry innovator, having introduced many ground-breaking products. SSgA manages the two largest ETFs globally, and our SPDR S&P US DIVIDEND ARISTOCRAT UCITS ETF is the largest dividend-paying ETF in Europe. 1.30 p.m. I cut through Iveagh Gardens on the way back to the desk. Our office overlooks this park, which is something of a hidden gem, a little oasis of calm in the centre of the city. Back at work, I catch up with my Marketing colleagues to discuss our annual Pensions & Investment Conference to be held in February 2014. This is our flagship event, providing us with an opportunity to draw on SSgA’s investment experts to share their insights on trends within our industry. We find many of them are very happy to travel to Dublin! Today, we try to put structure around the topics/themes that we believe will be most interesting and relevant to our attendees. 2:30 p.m. I have a lengthy meeting with our Client Relationship Management team. We are in planning mode for 2014 and spend the next two hours segmenting the market into the varying categories (Defined Benefit, Defined Contribution etc) and sharing thoughts and ideas on the challenges and opportunities that the coming year may present for each segment. These sessions are very worthwhile, and stimulate new ideas and thinking. Often, a key takeaway from these sessions is to initiate discussions with our European Product team to structure products that our clients need to meet their long-term investment goals. 4.30 p.m. I’m out of the office again to meet with one of the investment consulting firms. This is a follow-up on a recent meeting where we discussed SSgA’s alternative investment arm - SSARIS. It’s been a very successful year for the SSARIS Multi-Strategy Program that was launched in February this year in a Qualified Investor Fund (QIF) format. Performance has been strong and it meets the needs of investors who are looking for a strategy that aims to generate consistent absolute returns in any environment. 5.30 p.m. I catch up on e-mails from the day and try to finish off my ‘to do’ list compiled this morning. Does anyone actually achieve this anymore? Anything that needs to be addressed immediately is done and anything that can be completed the next morning is filed accordingly. I then catch up on my voicemails and return calls as required. 6.30 p.m. I tend to use the end of the work day to keep myself informed of general investment market trends and have a look at the performance of some of our active strategies. The SSgA website also has a great store of Thought Leadership articles, and I spend the next half hour reading significant pieces that have caught my eye. Today, I read Chris Probyn’s (SSgA’s Chief Economist) ‘Forecasts’ document, which provides an economic and financial market outlook as we enter the final stretch of 2013 and consider what 2014 might hold. I try to leave the office before 19:00 to get home before the kids go to bed.